For some time now we’ve been promising our vegetarian attendees of the Supper Club that we’ll devote a night just to them. What better day to do it than Earth Day, right? As it turns out, we had all omnivores at the party, no veggies. However, that didn’t stop us from having some great food … mostly desserts actually. The Farm and Potato Bleu Cheese pizzas from Flying Squirrel Pizza, veggie lasagna, a reconstructed edamame purée with micro greens and tiny tomatoes, pea “flan” with oyster mushrooms were the mains. For dessert we had a Momofuko sugar butter bomb that was so sweet we had to cut it with … yes … chocolate cheesecake. 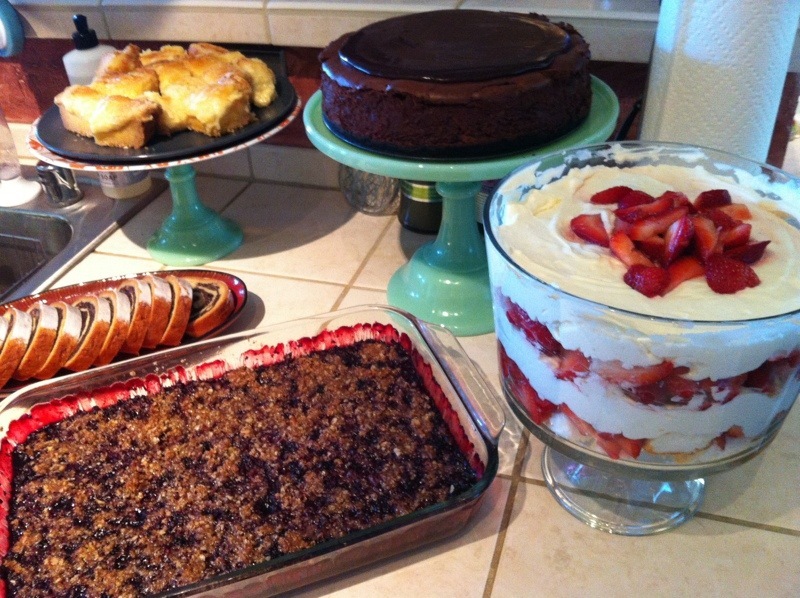 A lovely strawberry shortcake trifle, some super tasty baked blackberry deliciousness, a palette cleansing traditional Polish poppyseed cake. If you attended, please paste a link to your recipe or just throw it inline in the comments below so that others can enjoy. Preheat oven to 400°F. Water sauté the onion and garlic on high heat for 3 minutes in a wok or nonstick pan. Add the mushrooms and cook until the onions are limp and the mushrooms give up their liquid. Remove them to a large bowl with a slotted spoon. Reserve the mushroom liquid in the pan. Water sauté the broccoli and carrots for 5 minutes and add to the mushroom bowl. Sauté the peppers and corn until just beginning to soften. Add them to the vegetable bowl. Drain the tofu by wrapping in paper towels. Break it up directly in the towel and mix into the vegetable bowl. Add spices to the vegetable bowl and combine. Cover the bottom of a 9 x 13-inch casserole with a layer of sauce. Add a layer of noodles. Cover the noodles with sauce. This way the noodles cook in the oven, saving time and energy. Spread the vegetable mixture over the sauced noodles. Cover with a layer of noodles and another dressing of sauce. Add the spinach to the second layer of sauced noodles. Cover the spinach with the mashed sweet potatoes. Add the final layer of noodles and a last topping of sauce. Cover the lasagna with thinly sliced Roma tomatoes. Cover with parchment paper and then foil and bake in the over for 45 minutes. Remove the parchment paper and foil, sprinkle with the cashews, and return to the oven for 15 minutes. Let sit for 15 minutes before serving. NOTE: There is quite a bit of the veggie mixture leftover so you could make a smaller pan of lasagna. That way you would use more of the noodles; you might need another jar of sauce. This is the recipe I followed for the bars a.k.a. sugar bombs, but do yourself a favor – DON’T use the full pound of powdered sugar. Enjoy your sugar high and coma crash. I hope Barty recovered! 1. Preheat oven to 350 F. Line an 8 x 8 inch pan with parchment paper. 7. Cool completely in pan before cutting into 1-inch sqaures with a clean, dry knife. For best square results, pop into freezer and chill before slicing. I kinda winged this one. Slice fresh strawberries and mix with 1/4 cup sugar. Let sit for 30 minutes to get the juices going. Beat the cream with 1/4 cup sugar until stiff peaks form. In a 2nd bowl, beat cream cheese with 1/4 cup sugar until soft and creamy. Fold the whipped cream gently into the cream cheese until thoroughly combined. Cut the cake into small chunks. In a big bowl, arrange a layer of cake, then a layer of cream, then a layer of berries. Repeat. Top with a final layer of cream and some decorative berries. Oops – I missed a step in the Strawberry Trifle – add the vanilla to the cream cheese and sugar mixture. Here is the link for the Dark Chocolate Cheesecake http://www.epicurious.com/recipes/food/views/Deep-Dark-Chocolate-Cheesecake-236209. This was the best vegetarian dinner party ever!